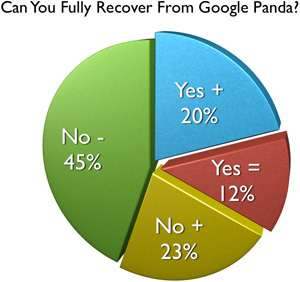 About a month ago, we asked our readers if you can fully recover from Google Panda. 68% of those who responded and there were about 200 responses, said you cannot fully recover from Panda. Let me give you the break down on the responses. The question asked was, "Can You Fully Recover From Google Panda?" 45% Said "No, Did Not Improve At All." 23% Said, "No But Improved Since First Hit." 20% Said, "Yes & More Traffic." 12% Said, "Yes But Same Traffic."